This tutorial shows you how to create a basic workflow and run it. After the splash screen you can see an empty workspace. The left panel is used to display the open workflows and their past executions. The right pane contains the list of available elementary components. The center pane is used to construct and display the workflows. To create a new workflow, open the workflow menu and click on new. Choose a name for your workflow (e.g., tutorial). From the right panel, drag and drop a File(s) element into the central panel. 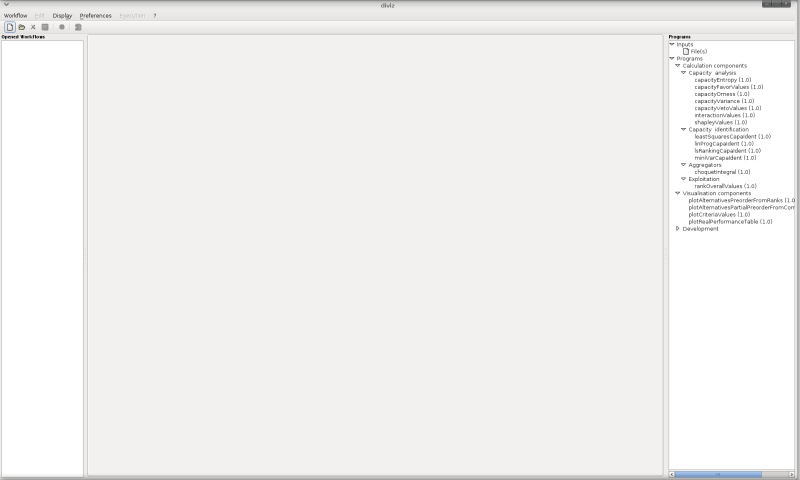 A dialog window will open and ask you to choose a file. Choose the file alternatives.xml that you downloaded earlier. You should now have a screen which looks similar to the following picture. You can now add an elementary component from the right panel which is called plotNumericPerformanceTable (under the category Visualisation components). Simply select it and drag and drop it to the central panel. performanceTable.xml to the entry called performanceTable. Simply do that by clicking on the bullet of a data file and draging your mouse to the corresponding entry of the component. Congratulations! 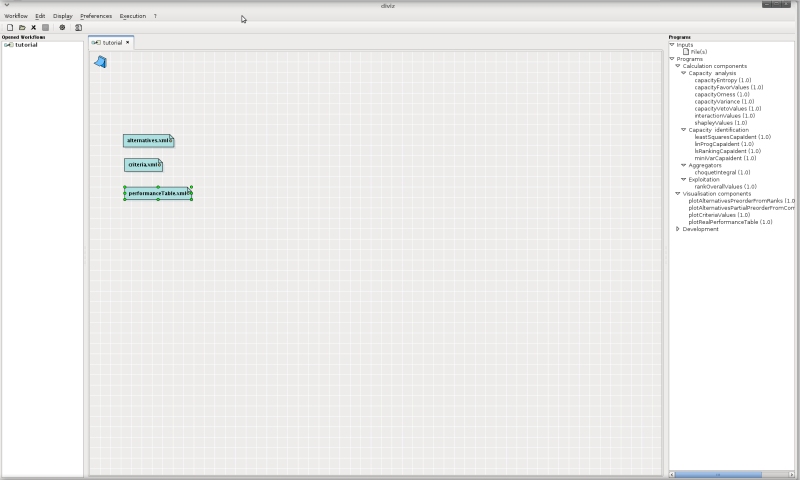 You have now created your first workflow in diviz. 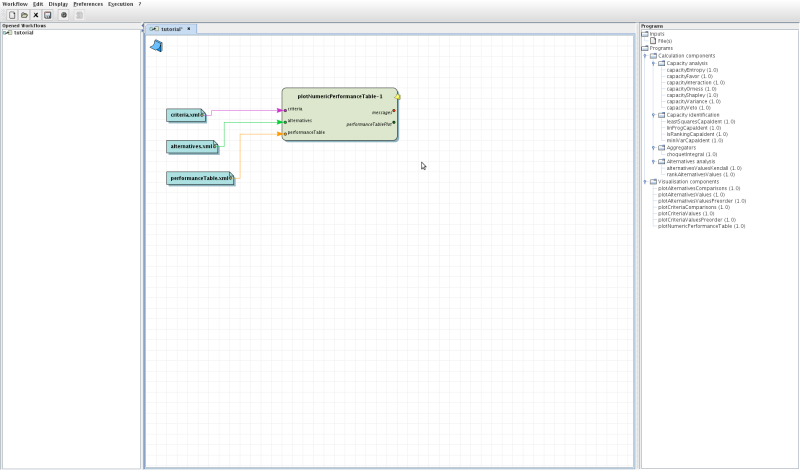 It is time now to execute the workflow and have a look at the output of the elementary component. You can do so via the Execution menu via the Run entry. After the workflow has been successfully executed, you can click on the entry below the name of your workflow in the left panel to view the results. Your screen should look like the following image. You can now click on the little file icons in the workflow to view the various files in the visualisation panel which has appeared under the workflow. 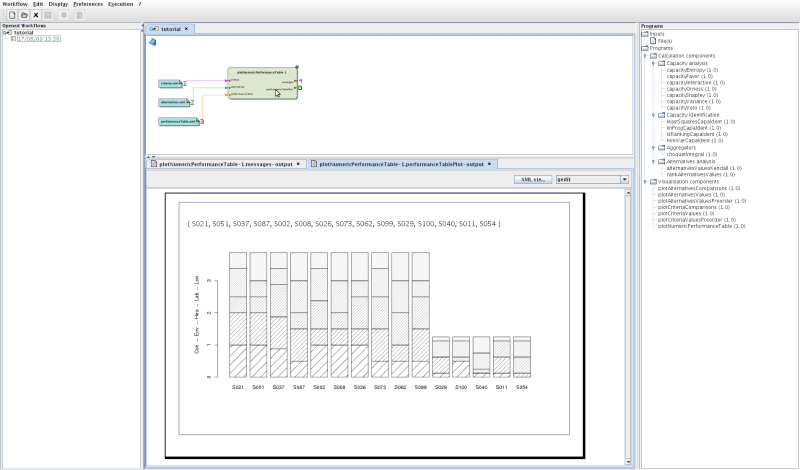 In particular the output of the elementary component plotRealPerformanceTable is a barchart of the performance table.